Two men. Two SUPs. Ten days. 240 miles and some unexpected sub zero temperatures! 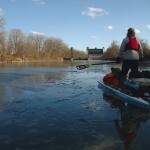 The Plastic Tides team launched on November 9th from Ithaca, NY with hopes to reach Albany via the Erie Canal. Just days into the expedition a winter storm warning became the infamous “Polar Vortex” that dumped punishing lake-effect snow on the Buffalo area and sent temperatures below freezing in all 50 states. The team battled freezing rain, brutal temperatures, and heavy snow on their journey through the heart of Central New York. Why? To raise awareness of plastic microbeads in cosmetic products and to push for a statewide ban on these products. 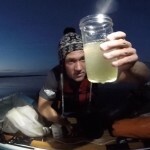 Despite the expedition being cut short after 180 miles due to impassable ice on the Erie Canal, the trip was a great success and ‘Plastic Tides’ co-founders Christian Shaw and Gordon Middleton collected some valuable samples and loudly spread the word about the microbead pollution in the marine environment. Their microbead survey was the first ever of the area (Finger Lakes and Upstate NY) and the results were pretty shocking. They found microbeads in Cayuga Lake, Oneida Lake, the Erie Canal and the Mohawk River. 70% of the samples contained one or more beads, and in Cayuga Lake from which 6 samples were taken, the highest abundance measured was 69,000 beads/kmsq with an average of 15,000 beads/kmsq. The team is currently working to write up the results into their first scientific paper. And their research is also cited in a February statement released by the NYS Attorney General, regarding the proposed ban of microbeads. Read here. The Plastic Tides team have also made a documentary about their adventure (see trailer above) Buy/rent your copy of the full documentary here. SB/What SUP equipment did you use? We used 12’6″ x 34″ x 9″ catamaran SUP’s built by LIVE watersports www.livewatersports.com out of Clearwater, FL and Werner Nitro paddles. Our boards were rigged by YakAttack.us with all the attachments and track mounting systems we needed. The Live boards are designed with a built in 6 track system for gear anchoring, camera mounting etc. SB/Is there a particular reason you choose twin hull SUPs? Yes. We haven’t found any boards that even compare when it comes to meeting our needs for expedition SUPing. The boards are incredibly stable, and fast under load. The 34″ wide deck (with no curving rails) was essential for performing research operations safely in the frigid weather. The height of the board also makes it easier to keep the deck dry. This is especially important when it’s below zero and the deck can freeze over. SB/What kit did you carrying with you? With an expedition like this much of our kit was to protect against the elements. We used a two person tent to conserve heat. Our food was sponsored by Backpackers Pantry and Clif Bar so we ate well! We prepared all our hot meals with a Jet-boil. We also had our manta trawl and sample jars (for research), as well as camera equipment. Gordon shot with a Sony RX-100 in an underwater housing and we both had Go-pros. We used Pelican hard cases that fix to the boards for especially sensitive or important gear and packed everything else in dry bags. We had a power pack and solar panels from Goal Zero, but keeping a charge up in the cold was a real challenge. We each had about 75kg of gear on board. SB/What kit could you not have done without!? There were two things that sick out as being essential. The SOL (survive outdoors longer) utility blanket, essentially a strong, but light tarp with heat reflective material. It really saved our butts when the tent’s waterproofing gave in and melting snow piled on the tent was seeping right over our groundsheet! The “blanket” was over top of it all and kept us dry. The second saviour was lots of pairs of wool socks. Wool is really essential and versatile in cold and wet situations and can be easily layered with neoprene. SB/What did you wear to paddle and how did you stay warm? We wore a combination of Hyper-flex wetsuits and standard snow gear, and for safety in rough water we would be sure to have a wetsuit under warmer dry tops. Once the weather got really cold and we were on flat water we kept to only our “drys” and made a rule not to get wet. Falling in would have had serious consequences. 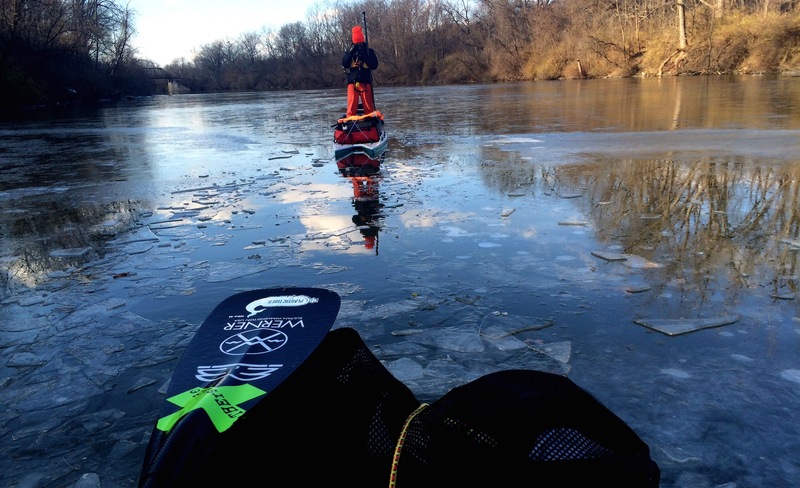 Maintaining a strong paddling pace helped to keep us warm, but not sweating much was also important. The toughest thing to keep warm was our feet. Despite thick 6mm booties and multiple pairs of woolies it was a struggle because your feet don’t need to move much when paddling flat-water. How did we stay warm?.. the answer is that we didn’t! The only time we were truly warm was in our sleeping bags at night! I wish I could say yes, because we were almost entirely, and had set out with the intention of doing so. But unfortunately the true answer is no. We were trying to make up time on Oneida Lake, paddling late into the night with the wind at our backs, when the cold weather truly hit hard. We started getting cold quickly, and had to make a hasty landing. Getting out of our wetsuits was a struggle. We ended up battling through hypothermic symptoms with a propane lamp burning hot in our tent all night. The next day we warmed up and dried our clothes at the Cornell University Shackleton Research Station on Oneida Lake. Luckily a friend was living there and we were smart enough to ask for help. We had made it through the night ok, but were in rough shape and had no good way to dry our wet/frozen wetsuits in order to paddle the second half of the lake. SB/Was the weather a bit of a shock or were you expecting it and well prepared? How cold was it?!! We knew the weather in Upstate, NY is unpredictable that season, but after paddling shirtless in sixty five degree sun the first days of the trip the extent of the cold was certainly shocking! We did know it might get pretty cold and were as prepared as we could be, but it wasn’t really enough. 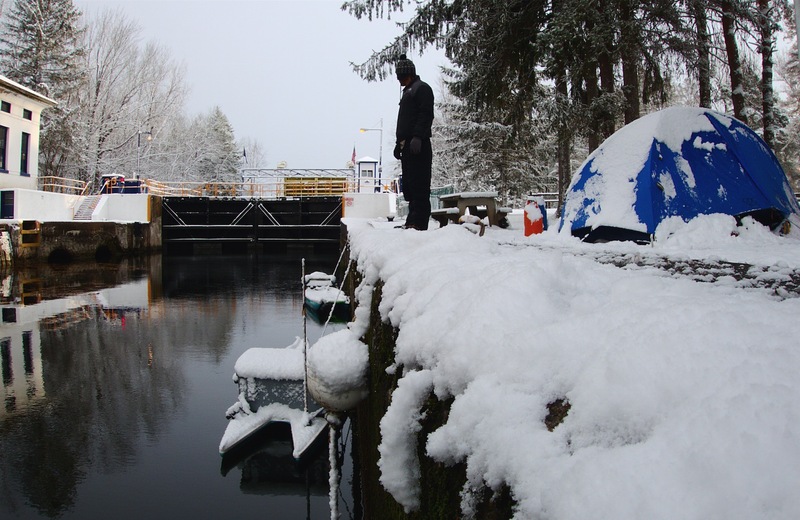 The budget was tight so we just made do with what gear we had, combining wetsuits with snow gear and made sure not to fall in. The appropriate weather gear for a trip like this would be ocean suits, which we hope to acquire before we try anything similar again. I’m not sure exactly how cold it got, but it was well below freezing, down into the teens F.
SB/Did you ever consider turning back or giving up due to the harsh temperatures?!! SB/What was the biggest challenge you faced and how did you overcome it? The hypothermia incident was the biggest challenge. We didn’t publicize any of it until now because we knew our families would be worried about us! It was really sobering to feel that extreme cold, and it was tough to surrender our pride and take support. It was really energizing to overcome it though and get back out there stronger. In the end our trip wasn’t really about being self sufficient. It was about bringing attention to the threat of plastic micro-beads and the help we got allowed us to push on with our message. SB/What was the high point and low point of the trip? 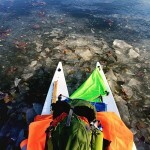 Besides the hypothermia, the definite low point of the trip was paddling a stretch of the canal near Rome, NY. We paddled for 20 miles into freezing rain and an intense headwind. One stretch of the canal is over 10 miles perfectly straight. We dubbed this the “Corridor from Hell” because the wind was funnelling straight down it. The high point came the next day. We were blessed with sunshine, a stiff tailwind, and we finally made it onto the Mohawk River heading downstream. SB/Any tips on what to pack for a winter SUP adventure? Get an ocean suit and don’t forget to bring some rock salt for your deck! We’re currently working to write up the results into our first scientific paper, coordinating with media to spread the word about microbeads, and planning our next endeavor. Our sights are set on challenges including the Northwest Passage, Mississippi River, St. Lawrence River, Patagonia, and the Amazon. To compliment compelling adventures and media production our team stays grounded by focusing on outreach efforts to educate the youth by building a connection with the water through paddling and conservation. This summer the team plans to expand on our data set of microbeads from Cayuga Lake by sampling nearby Finger Lakes as well as beginning to measure other types of marine plastic in the lakes such as clothing fibers from laundry effluent. These fibers have already been found inside fish caught in the Great Lakes. These efforts will be assisted by our summer internship program geared towards middle and high school students with a thirst for hands on research opportunities and time on the water. We hope to expand the network of paddlers actively focused on conservation by equipping others with expeditionary tendencies with the tools to make an impact through our ambassador program. Interested in being involved? Get in contact at info@plastictides.org. Find out more about the Plastic Tides on their Facebook here and their website here. The SUPboarder team wishes the guys behind Plastic Tides all the best with their future research and expeditions. You’re doing a great job raising awareness about marine pollution. And also showing what can be done with a SUP! Hope the weather is a bit kinder for you on your next trip! 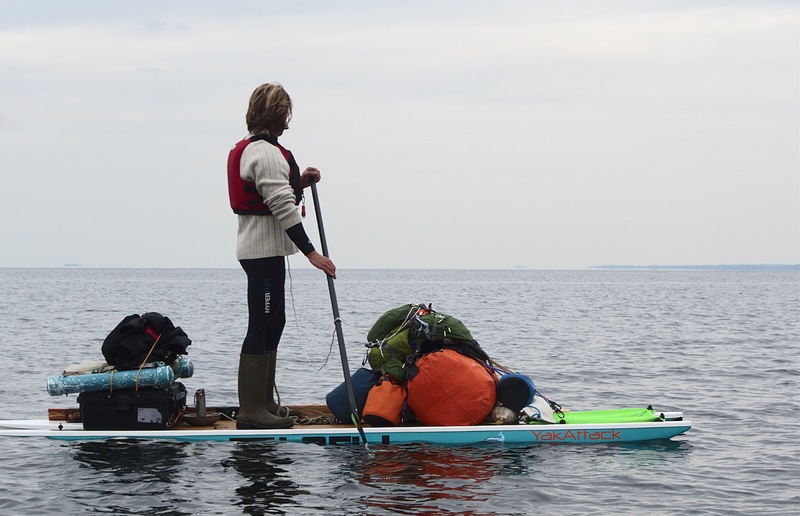 A SUP is the perfect means of transport for an expedition or for carrying out research on the water. But before you embark on a chilly and more challenging winter SUP adventure why not make the most of the sunshine and plan a summer one!